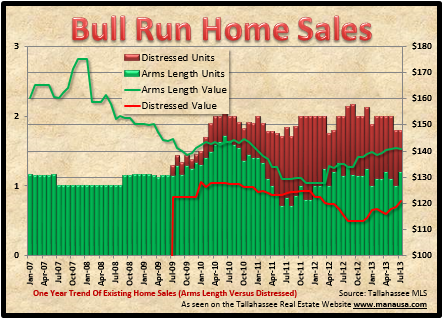 Today we continue with our mid-year housing reports with a look at the Bull Run Subdivision in Northeast Tallahassee. In case you missed them, you might want to also see our reports on Killearn Acres and Piney Z. 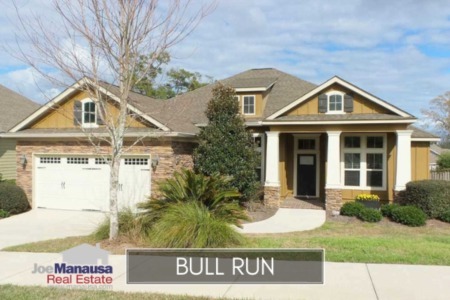 For the past several years, Bull Run has posted enough home sales to land in the top 5 most active neighborhoods in Tallahassee. New construction has been very active (in a market with almost no new construction), so it is a neighborhood we like to monitor regularly. 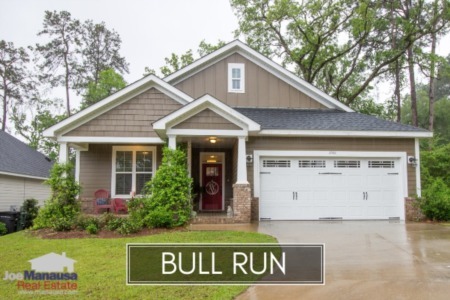 Currently, there are 14 homes for sale in Bull Run, ranging in price from $260,000 to $360,000. 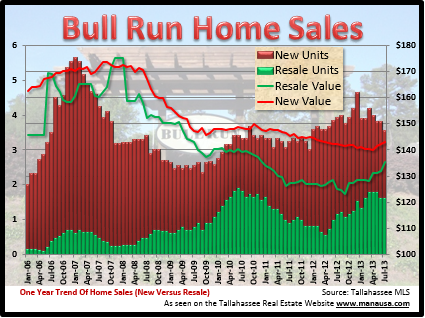 When we look at our first Bull Run home sales graph below, we see that new home sales still lead existing home sales each month. The green vertical lines show the number of existing home sales (measured on the left vertical axis) while the red vertical lines measure the number of new home sales in Bull Run. Simultaneously, we see the one-year trend of home values (measured on the right vertical axis) show with new homes selling for roughly $143 per square foot while existing home sales are selling for $136 per square foot. Currently, the average value of new homes and existing homes would appear to be on the rise. But when we break existing home sales down between distressed home sales and arms length home sale in Bull Run, we see that distressed sales are making up some distance with arms length sales. The green vertical lines show the number of sales by type (left vertical axis) while the horizontal lines shows the one-year trend of home values (right vertical axis). Remember, new home sales were removed, and we are looking at what existing home sellers are getting for their homes. The green line shows that values seem so have stabilized around $140 per square foot, while distressed sales are just above $120 per square foot.